The former Archbishop of Canterbury has presided over a controversial service in the United States for members of churches who oppose gay clergy. Lord Carey confirmed 300 people as members of the Anglican Church there. They are from parishes in the state of Virginia that are boycotting their own bishop over his support for gay cleric Gene Robinson. 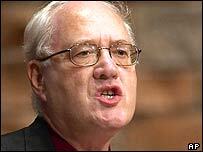 Lord Carey's intervention has been condemned as provocative and insensitive. If the division of the worldwide Anglican communion has not yet been announced, the Church in America is already breaking apart. Californian churches are at war with their leadership, and now 12 of the nearly 200 parishes in the diocese of Virginia have shunned their own bishop, Peter Lee, for endorsing the election of Gene Robinson as Bishop of New Hampshire. Bishop Lee says it is painful for him, but in order to secure a temporary truce, he invited Lord Carey, a traditionalist, to conduct these confirmations for him. The intervention of such a high-profile figure has been attacked as insensitive and needlessly provocative. Lord Carey's visit comes only a month before a major report on the homosexuality crisis in the Church is unveiled. His successor as head of the Anglican communion, the Archbishop Dr Rowan Williams, has appealed for a period of calm and reflection, but churches are already plotting their own futures. Some American parishes are now being overseen by bishops in Africa, and Lord Carey's arrival as a so-called flying bishop may be seen as a model for the way ahead.